An Oxford University study being spread by mainstream news outlets that claims Trump supporters share the most fake news is itself fake news. Researchers at the Computational Propaganda Project, who are the recipients of over $200,000 in taxpayer funding, spent "several years" developing its "junk news" list, which is actually full of the most popular conservative websites on the internet. Websites included on the researchers' "watch list" of propaganda news outlets includes the Washington Free Beacon, the Daily Caller, National Review, and the Drudge Report, which is the seventh most highly visited media publication in the United States. Contrary to the claim that conservatives are sharing the most fake news, the study proves nothing other than finding conservatives tend to share conservative media online. Philip N. Howard, Vidya Narayanan, Bence Kollanyi, and Lisa-Maria Neudert of Oxford University wrote the six-page study, along with Vlad Barash and John Kelly who work for Graphika, a social media startup that "provides the context needed to make strategic business decisions." 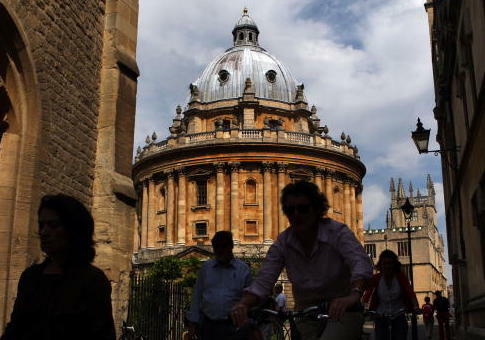 Oxford publicized its results Tuesday with a provocative press release that declared, "Trump supporters and extreme right ‘share widest range of junk news.'" The sweeping claim that Trump supporters circulate more fake news than "all other political audience groups combined" was based on analysis of three months of tweets. "We find that the political landscape is strikingly divided across ideological lines when it comes to who is sharing junk news," said Neudert. "We find that Trump supporters, hard conservatives and right-wing groups are circulating more junk news than other groups." The purpose of Oxford's Computational Propaganda Project is to analyze how social media can be used to "manipulate public opinion." Media outlets seized on the study. The Huffington Post reported, "Trump supporters consume and share the most fake news." "Fake news sharing in US is a rightwing thing, says study," said the Guardian. "Trump supporters share the most ‘junk' news, conspiracy theories: study," wrote Salon. "Trump supporters spread the majority of phony news on social media," according to Mother Jones. The Financial Times: "Hard right dominates use of fake US news, Oxford study finds." Newsweek, the Week, and the Independent covered the study in the same way. None of the news articles explain how the researchers defined "junk news," including a Washington Post analysis that used the study to argue there is a "Trumpian threat to democracy." Post analyses are intended to be "interpretation of the news based on evidence, including data." The Post wrote that the study was based on "91 sources of propaganda" from "across the political spectrum" that are "deliberately misleading or masquerading as authentic reporting." The Post stated that the study "restores a bit of clarity to what ‘fake news' actually represents." In fact, an analysis of the "junk news" list reveals numerous flaws. The list was not derived from "across the political spectrum," but full of mainstream conservative news and commentary sites, with no mainstream sites from the left. Just 6 out of 91 sources of the "junk news" list are left-wing websites, and none are easily recognizable. The six left-wing websites include: BipartisanReport.com, CrooksAndLiars.com, DeepStateNation.com, OccupyDemocrats.com, ShareBlue.com, and DailyNewsBin.com, which no longer exists. The site became the Palmer Report, a liberal blog. There are 70 right-wing websites, with varying degrees of views on the spectrum. Many are marginal, and some publish unverified stories, such as PuppetStringNews.com. Numerous sites on the "junk news" list are, however, mainstream conservative outlets that are widely read and shared. The Free Beacon appears on the list, and the example link of "fake news" is a write-up of comments Sen. Claire McCaskill (D., Mo.) made on MSNBC about the investigation into Hillary Clinton's email server. The Drudge Report—a news site that receives more than 2 million unique visitors daily—is "junk news," according to Oxford. So are Breitbart and the Daily Caller, which are also among the top 100 visited media publications. Also listed as "junk news" are popular conservative outlets Campus Reform, CNSNews.com, Fox News personality Sean Hannity's official website, Hot Air, NewsBusters, Red State, and the Federalist, which features mostly commentary. The website of National Review, which was founded by William F. Buckley Jr., the intellectual force behind the modern conservatism movement, is also "junk news." Aside from conservative commentary and opinion, the "junk news" list also features other right-leaning sites that are not news outlets, including Rasmussen Reports, which was among the more accurate polls during the 2016 election. The example link that Oxford uses is a Rasmussen poll that showed Trump and Clinton within the margin of error the day before the election. Judicial Watch appears as well, though it is not a news site but rather a legal watchdog group that engages in Freedom of Information Act lawsuits. There are no comparable left-leaning outlets, such as Mother Jones, Think Progress, Salon, or liberal magazines, like the New Republic or the Nation, on the list. The remaining sources are either fringe websites like YourNewsWire.com, have no discernible political bias, or appear to have ended up on the list inadvertently. For instance, "Hot Page News," a site that simply aggregates links from other news websites, appears on the list. However, the example link for the website redirects to a New York Post article about Trump calling the widow of an NYPD cop who was killed in the line of duty. Also considered "junk news" are Mediate, a nonideological outlet that covers the media, and the New York Daily News. Phillip Howard, a lead researcher on the study, is guilty of sharing "junk news," by the study's own standards. He shared a New York Daily News article about Trump and GOP donor Robert Mercer on Twitter. The study claims that its "junk news" list was based on a "grounded typology" developed by a "team of 12 trained coders," who claim to be "familiar with the US political and media landscape." The researchers claim outlets that were labeled "junk news" had to meet three of five categories. The criteria included: "professionalism," "style," "credibility," "bias," and "counterfeit." The coders came up with the "junk news" list over a period of "several years." They concluded that all 91 sources "produce content that includes various forms of propaganda and ideologically extreme, hyper-partisan, and conspiratorial political information." The researchers also claim the sources of "junk news" were "evaluated and re-evaluated in a rigorously iterative coding process." Multiple requests for comment sent to the researchers were not returned on how prominent conservative websites ended up on the list, but left-leaning websites did not. Nevertheless, the researchers used their list as an authoritative category of "propaganda" and concluded that Trump supporters and conservatives shared "propaganda" the most. "A high value for coverage shows that the group is sharing a wide range of propaganda," the study said. "Coverage" is the percentage of links posted that belonged to the "junk news" list. Conservative Media had a coverage of 95, while Trump Support had a coverage of 96, showing they shared the outlets on the "junk news" list the most. In other words, 95 percent of conservative media and Trump supporters shared conservative media sources like the Drudge Report, Free Beacon, and National Review. Unsurprisingly, only 11 percent of links posted by the study's Democratic Party sample came from these right-leaning sources. However, the study did find a "deep connection" between the Democrat group and the mainstream media. The Computational Propaganda Research Project, the Oxford institute behind the study that tainted numerous mainstream conservative outlets as "propaganda," is taxpayer funded. The project's mission is to analyze how social media bots are used to "manipulate public opinion by amplifying or repressing political content, disinformation, hate speech, and junk news." Sources of its funding appear on its website, with the National Science Foundation listed right above Open Society Foundations, which is funded by liberal billionaire George Soros. The study stated the authors "gratefully acknowledge the support of the National Science Foundation," disclosing a grant on "Computational Propaganda and the Production/Detection of Bots." The award named Philip Howard as the principal investigator and was given during the Obama administration. The project received $218,825 in taxpayer funding beginning in August 2014. The National Science Foundation grant warned that political bots are "manipulating public opinion." "This project enables a new team of social and information scientists to investigate the impact of automated scripts, commonly called bots, on social media," the grant stated. The institute aimed to be the solution to misinformation online. "By developing a network of experts in political bot detection and an original data set, the researchers will not only have a better understanding of how bots are manipulating social networks but also advance the conversation in the social sciences, computer sciences, and industry about the size of the problem and the possible solutions," the grant stated. Update Feb. 10, 2017, 12:04 p.m.: Following publication, Howard told the Free Beacon that his researchers are classifying outlets as "junk news" even though it is "impossible to evaluate the fact checking procedure of a particular organization or a particular piece of political news." "The list of sources doesn't include all the possible sources, just the ones shared around a particular set of hashtags over a three month period," he said. Howard said the researchers "weren't selecting on the basis of ideology" for the "junk news" list, though did not explain why so few liberal mainstream outlets ended up on it. Howard also said the researchers did not "really test for how many people believe this stuff [junk news]," which would be columns and articles in the pages of the Free Beacon and National Review. Howard did address why the Drudge Report was on the "junk news" list, and said the website that broke the Monica Lewinsky scandal should not be considered in the "main professional news category." "Drudge is also good question and this is on the list of things we reconsidering as we get ready for academic publication," he said. "It was probably coded that way because on the days it was examined it was providing a lot of headline links to other sites that would fit the criteria. We could create another category of ‘aggregator' but the way drudge is used on social media is often along the lines of ‘Drudge reports that…'"
"The site is often referred to as a source for breaking conspiracy news," he said. "I don't believe it should be put into the main professional news category or the other categories of political news and information. Open to advice on this one." Howard also disputed that taxpayer funding went to the study, though the paper identifies the grant as supporting the research. "The grant you identify wound up several years ago and didn't fund this particular research," he said. "But yes I do think US taxpayers should pay for research that is critical of the media and demonstrates ways to improve public life. "It is great if individual readers and other journalists can think critically about how the news media is doing," he added. "But you want to be systematic in identifying big picture problems and solutions." This entry was posted in Issues and tagged Fake News, Government Spending, Government Waste, Media Bias. Bookmark the permalink.